In his latest role with the Orioles, Spiro was responsible for all of the club’s broadcast and online operations, media relations, marketing, publishing, special events, ballpark entertainment and community outreach activities. 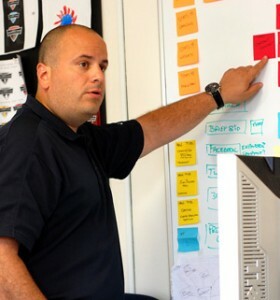 After more than 15 years of delivering innovation in the areas of digital sports content, event management, and fan experience – Spiro set out on a mission to help companies (and individuals) realize their potential through progressive thinking, smart utilization of technology, and world-class customer service. All without the typical and excruciating “methods and costs” that usually come with working with traditional agencies. Our ability to quickly & efficiently develop custom solutions for your company comes from Spiro’s innate capacity to quickly target areas of growth, identify strengths and weaknesses, and effectively leverage emerging technology to provide a clear cut and effective path to success and sustainable growth. In his role with ACS, Spiro managed a team of over 50 designers, programmers, and editors and consulted teams on emerging technologies and maximizing corporate sponsorships and fan interaction through the internet. Spiro’s work in these early days of the modern internet was revolutionary and laid the groundwork for some of the world’s most successful digital sports properties. After ACS Sports, Spiro co-founded Power Plant Studios, a marketing and interactive development services company that specialized in digital sports content, sponsorships and branding. Among Power Plant’s clients were Cal Ripken Jr., the NBA, and Lucent Technologies. At Lucent Technologies, Spiro worked as part of a five person blue-chip panel consisting of engineers, and emerging technology specialists to create products for the sports space in the areas of wireless networking, interactive sports content and streaming technologies. Spiro served as the team’s sports content specialist and was responsible for defining the needs of the sports minded consumer. From 1992 to 1999, Spiro served the Orioles in various capacities from Assistant Director of Media Relations to Director of Special Events and Online Services. In September of 1995, Spiro served as Executive Producer for the celebration and ceremonies surrounding Cal Ripken’s record breaking run at 2131. Spiro and his staff were responsible for orchestrating what was later voted on by baseball fans worldwide as baseball’s All-Time Greatest Moment.